You've probably heard about Solar Freakin' Roadways!, a video published by Scott Brusaw to generate attention for his Indiegogo project. If not, it's viewable below. Before you get hyped, despite raising 2.2 million bucks, it has not produced much in the way of tangible results and its feasibility has been thoroughly debunked - at least Scott's version of the roadway. Expensive to produce at an estimated $10,000 for 13.69 square meters or $730 per square meter, with low durability, a short life-span, and LEDs that consumed too much power, these did not get very far. He is still accepting funding though. 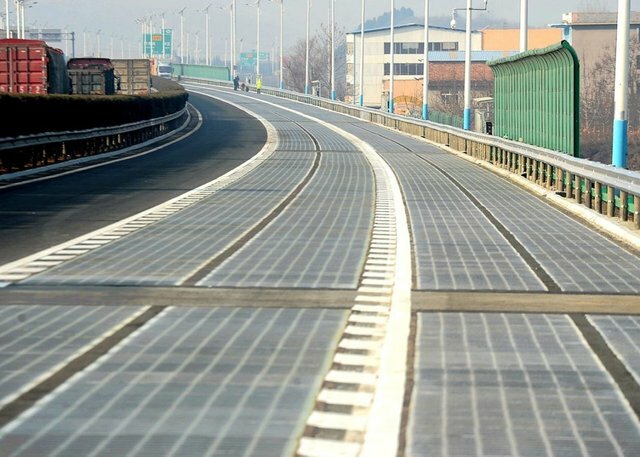 Colas, an Anglo-French construction company one-upped the much-hyped Solar Freakin' Roadways with a solar unfreakin' roadway last year. Their version turns out to be be prohibitively expensive at 5 million Euros for a kilometer of a single-lane road, or a whopping $4,500 per square meter. In 2014, the Netherlands also spent an amazing 3 million Euros or $3.7 million, for an underwhelming 70-meter bike path (at 140 square meters, that's $26,428 per square meter), making the French endeavor look positively cost-effective. You might be surprised, but despite being one of the biggest, if not the biggest polluters in the world, China is also spending the most on sustainable energy and, for now, leads the way in solar panel production. With this in mind, you should be less surprised that it too has thrown its hat into the solar roadway roundabout by opening the world's first kilometer-long solar highway (because it has both lanes covered). The roadways are made with a transparent layer of concrete on top for durability, a middle layer of photovoltaic panels, and a bottom insulating layer. Vehicles can apparently travel at 100km/h across the special highway without destroying the solar cells, and it is claimed that electric vehicles could soon be charged while traversing across it.